I’m a mum with 2 kids, Keagan is 4 and Keira is 20 months. Being a stay at home mum I was in the position most mums are in and decided I needed a creative out let, a break away from the hours spent with children as the focus and a way to make little extra money, so I started by making quilts, I then made bassinets (similar to Cariboo), then due to time constraints and having a second child, I moved on to taggies, aplique dresses, knotted cuddle blankets and aromatherapy sock monkeys. I made stuffed monsters, aliens, porcupine pin cushions, ladybird cushions and my latest creation ‘duck’ who goes everywhere with my daughter and who I wish I hadn’t made white! Anyway, back to the product at hand. . When Keira was 9 months old I moved her from a capsule to a standard car seat. I took Keagan to kindy and on the way home Keira fell asleep as we were turning into our street. So while I was sitting in the car wondering what to do with myself and thinking of all those things I could be doing upstairs I came up with an idea that had transformed into the MOAI - the name coming from Necessity...the Mother Of All Invention. 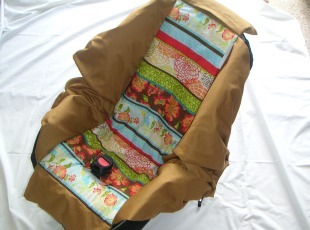 MOAI is a fabric car seat cover with handles allowing you to move your sleeping child without waking them. 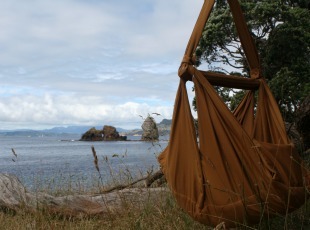 It can be laid flat in the cot or hung as a hammock. It can also be worn as a sling or frontpack. It is handmade by my mother-in-law Patricia Scott-Woods who is a seamstress with 50 years experience. My design and idea, her sewing skills. The Natural Parent Magazine, 4 books about trucks, trains, planes etc, my daughters bead toy. - Please don’t ask whats on my work table! "Watching you sleep, watching you breathe, a peaceful end to another playful day. You, my little one, take my breath away." I love this quote. It is what every mother has felt and is so beautifully expressed. My mother in law is one of my creative role model when it comes to sewing, my husband Brendan Scott-Woods when it comes to all things architectural and design related. My father,John Birch, who has always been amazingly talented with his hands, woodwork, photography, models, music - he is a music teacher, conductor and organist. Any kind of sewing creation. I love handmade toys. Business I guess as well, marketing, ways to reach people. Jewelry making. Soft toy making. Woodwork. Its hard. Something always has to give, in my house its the housework I think :-) I have a family and small children so they are my priority . But without a creative outlet I feel a little lost so I find myself staying up until midnight each night so that the days can be spent with my kids. Not sure really. I did make a “Why-Knots” knotted fleece dress that I thought was going to be a complete failure so didn’t focus much while doing the aplique. I love the dress now and Keira wears it all the time. Dining room table. Oh what I’d give for a studio! Mums around the world know about MOAI because it can make their lives so much easier! It has made mine. I get 2 hours uninterrupted work or play-with-Keagan time every day because of it. 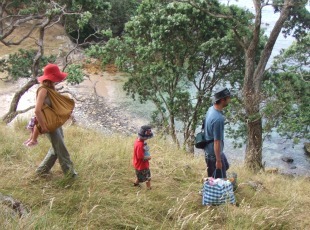 I wish to be able to help our family financially and not rely totally on my husband, to be able to pay my parents back for all their help and bring them to NZ for a visit because I miss them I wish to be able to go to my closest friends 40th birthday in Sept (on the same day as my birthday) . I know wishes should be so much less financial but sometimes its hard for them to be anything but. I guess mostly like everyone else I just wish for happiness, friendship and to be a good mum and wife. Yes, I must say too, you are a real inventor there! Great job! Good luck with your business! I SO wish I had had one of these when my children were young! If I'm ever a grandma this will be in my essential items gift package!! Beautiful page! I just created a new team on etsy!